The Tree of Life is my personal favorite piece. I see the Tree of Life and The Water Trellis, as the Yin and Yang of my fountain designs. The Tree of Life with its graceful spiraling leaves represents the feminine energy of Yin. While the taller, more linear and calculated Water Trellis represents the masculine balance of the Yang. 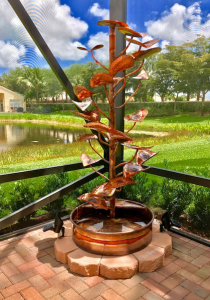 The Tree of Life is the most popular larger fountain I make. It has a sweet delicate sound that is a welcome addition to any room, deck, or garden. People who have a Tree of Life in their home always enjoy its ambiance, and the wonder it creates. 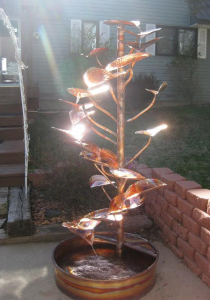 I also make this piece without the extra leaves, and with the addition of an electric light on top. If you want to see something truly magical, check out the Tree of Life/Floorlamp.